CHARLOTTE, N.C. – No. 15 Clemson scored seven two-out runs in the game and plated four runs in the last three innings in its 8-5 victory over Charlotte in the Tigers’ first game at BB&T Ballpark on Tuesday night. Clemson, who won both games of the home-and-home season series, improved to 19-6, while the 49ers dropped to 11-13. In the first inning, Kyle Wilkie hit a two-out double and scored on Grayson Byrd’s triple. 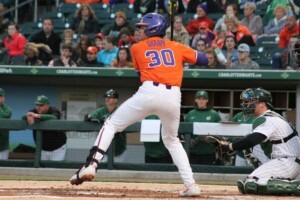 Byrd lined a two-out, two-run double in the top of the third inning, then Bryar Hawkins belted a run-scoring single to give Clemson, who won its 13th game in a row following a loss dating to 2018, a 4-0 lead. In the bottom of the third inning, Harris Yett crushed a two-run homer, then the 49ers plated two runs in the sixth inning to tie the score 4-4. After making a run-saving catch to end the sixth inning, Bo Majkowski laced a two-out, run-scoring single in the seventh inning to give the Tigers the lead. After Logan Davidson extended his hitting streak to 13 games with a single in the eighth inning, Kyle Wilkie scored Sam Hall on a groundout. Byrd added his fourth RBI of the game on a two-out single to score Davidson, then Davis Sharpe walked with the bases loaded. Tiger reliever Holt Jones (1-0) earned the win, as he pitched 3.0 hitless and scoreless innings with three strikeouts. Charlotte reliever Colby Bruce (0-3) suffered the loss. The Tigers continue their road swing with a three-game series at Virginia Tech beginning Friday at 6 p.m. on ACC Network Extra.